Heyyyy…..Lisa Willis has a new job playing for the Monarchs. 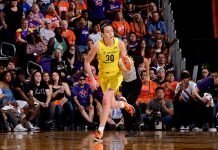 The LA native, who played for the Sparks and the Liberty before being cut last spring, was signed to a seven-day contract today to play up north. I guess all that pickup at the gym has paid off. Meanwhile, today another LA native and UCLA alumni – Noelle Quinn – hosted a Nike event in Hollywood today for the Chatsworth High School basketball team. Lucky girls. And surprise, surprise: Kat Lyons is back at Marist, and playing for the team. She is the player whose scholarship was cut after she admitted depression. A lawsuit she brought against the University was thrown out last month. Nikki Caldwell Pondering: Why do fat chance and slim chance mean the same thing? I’m still smiling four hours later. Ah yes i see what happened you read the Poughkeepsie Journal – Couple of things are wrong with that article – 1)I wasn't tossed out as the paper reported rather a settlement was reached in June and the case was dissmissed as long as the terms of the settlement where followed. 2)Also they suspended her yes but never took the scholarship away, never removed her from the roster or website, also never used that scholarship for another player – which they very easily done. Out of curiosity, where are you getting your information? "Couple of things are wrong with that article – 1)I wasn't tossed out as the paper reported rather a settlement was reached in June and the case was dissmissed as long as the terms of the settlement where followed." When the anonymous poster posted the above in the first tense, ex: "I wasnt tossed out….." doesnt that make the poster "Kat"? ?